Many of our clients come to us looking for a complete backyard remodel. Whether they are a new homeowner looking to change the existing layout, or long term residents looking to finally make the changes they’ve always wanted, we design all types of renovations and remodels. While it may seem overwhelming at first, working with an experienced team of architects and designers helps to alleviate the the stress involved. One of our most in demand services when it comes to backyard remodels, is taking the existing property and being able to provide custom outdoor living designs. Across the east coast, the trend of incorporating outdoor living designs into properties has drastically increased over the past few years. With the beautiful seasons we experience in the region, many homeowners choose to work on a backyard remodel to maximize the potential of enjoying time outside. Increasing property value and expanding on additional living space are other main benefits of creating these outdoor rooms. Deciding on what can be incorporated into your property, depends on the size of the lot and the needs of the client. Everything from outdoor kitchens and outdoor bars, outdoor fireplaces and fire pits, to outdoor patios and decks, there are many ways to customize and create ideal outdoor living designs for each client. Depending on what the client is looking to achieve with their property, the space can be tailored to suit their needs. Whether it is a relaxing, fireplace area to use all year round, or an outdoor kitchen for dining outside with family, we can create outdoor living designs to transform the backyard space into a whole new lifestyle. Depending on the lot coverage, permits the town requires, budget set by the client, and the existing architecture of the home, will all contribute to the deciding factors in a backyard remodel. In designing our backyard remodel, the landscape design is specifically structured to best complement the style of the property as well as thrive under the existing conditions. When it comes to the hardscape design, every structure is designed and built to serve a purpose. Walkways and pathways are incorporated to lead through gardens and alleviate food traffic from the lawn. This helps in an aesthetic purpose but to also preserve the growing grass and surrounding specimens. Retaining walls are also used to help the property, by correcting grade changes and containing soil and planting beds. 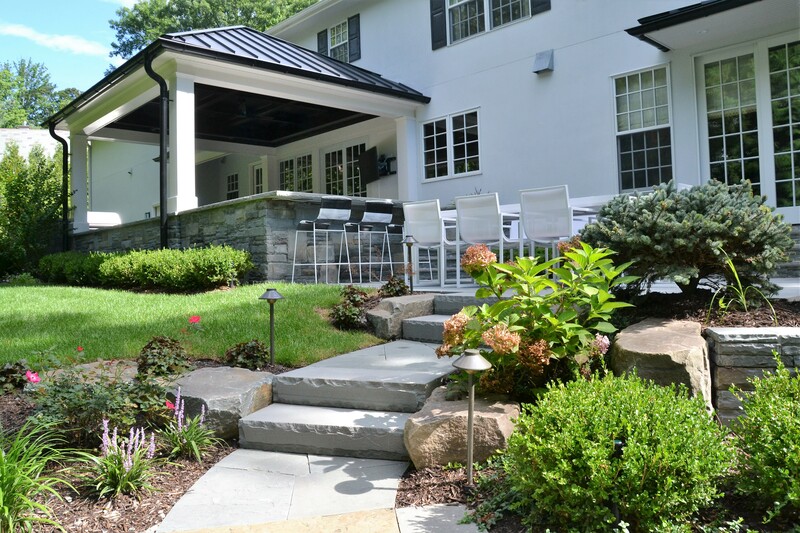 We are an experienced team of architects and designers that are here to help you plan, design, build and maintain your ideal backyard remodel today. Feel free to get in touch for a free consultation of your property and project.